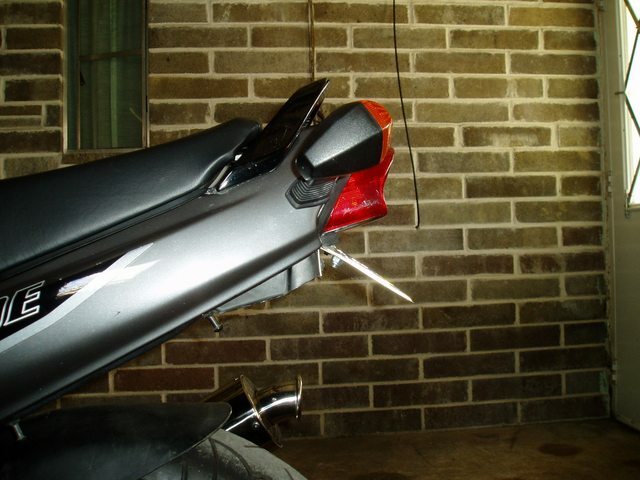 There are many ways to cut off the fender of a bike -some are quite involved and elaborate. I chose the easiest way possible. 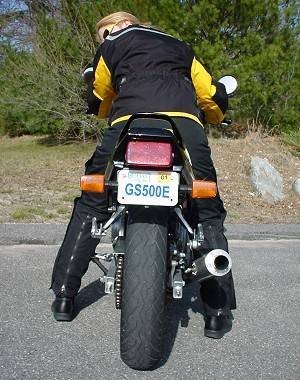 Many other bikes have fender eliminator kits available to make the job easy and look great but not the little GS so we need to do something. Removing the rear fender is quite easy. Remove the seat, remove one bolt from the front, 2 from the sides and 2 from the rear. Once it's removed you are ready to begin. I used a dremmel (the greatest tool ever made) with a metal cutter at slow speed to cut the plastic because it cuts straight and at slow speeds cuts plastic pretty well. Of course you can use anything you like. Many people use a razor knife or exacto knife to cut the fender. I did this because the sun has already started to bleach out the fender and it looks bad. 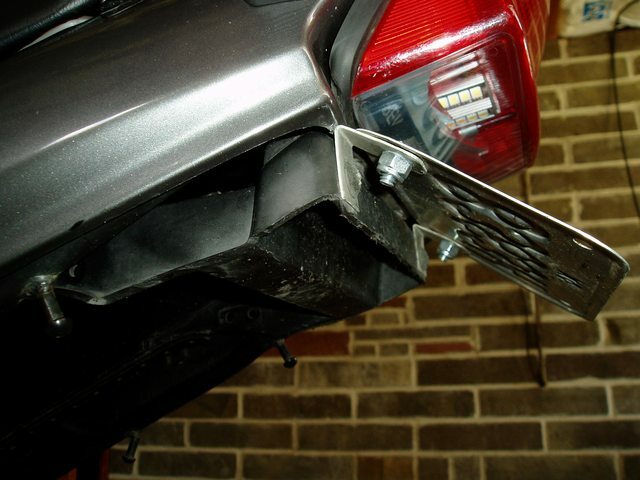 A simple bracket is all that's necessary to move the license plate giving the rear end a sportier look. Notice the angle of the plate (barely visible from side) mirrors the angle of the grab bar. In order to do this you'll need to do several things. 1) You'll have to have a sheet metal bracket made. Mine was 16ga steel, 6 1/4" wide and 2" tall. Drill 4 holes, 2 down near the very bottom edge for license and 2 about 1/2" down from top and 3"-5" apart (these can be anywhere and exact location isn't really important). This can be made by any sheet metal fabricator or you can do it yourself. 2) Remove the tool kit for now. 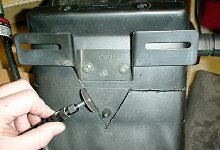 You are going to install the bracket on the front lower face of where the tool kit rests. Drill 2 holes in the inner fender into the area of the tool kit. Use the 2 nuts and bolts holding the stock license bracket in place here. 3) In order to get the taillight to light up the plate you need to do a serious fenderectomy. Cut off the rear fender up to the body. 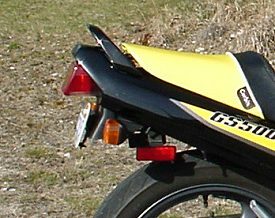 You end up leaving the tool kit area as the exposed rear face, and the two rear screw holding the inner fender in place are concealed just inside the rear bodywork (on 2001 model, older models need to verify this). 4) Attach license place to bracket. 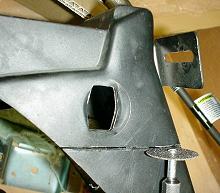 If you made the bracket 2" tall the bracket will slide inside the fender snug to the top and sides and leave just enough to mount the license tight to the upper bodywork, exposing no bracket from rear view. You can make a taller bracket if you want the plate lower. As it is now the light gets cut off just above the letters. Check your state's laws governing license plate mounting and lighting. I wanted to remove as much of the stock fender as possible so I mounted my signals up on the tail plastics and hooked them up with quick-disconnects for when I need to remove the plastics. 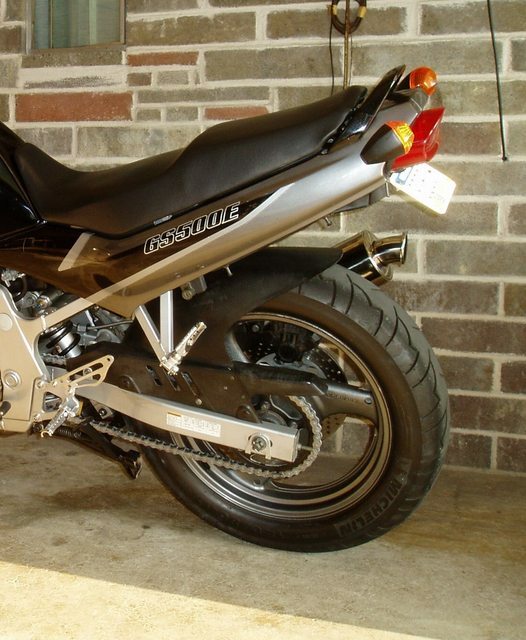 This would probably look silly with OEM GS signals so you might want to look into a different style. 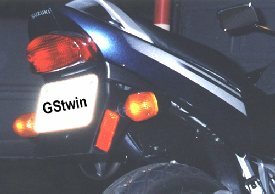 Mine are from a 2001 GSXR but I've also seen flush-mount aftermarket GS ones mounted as well. I made two small strips of aluminum and bent them into a V shape for the license plate and attached with stainless hardware but you can also just mount the plate to the plastic that is left if you don't mind it hanging vertically. 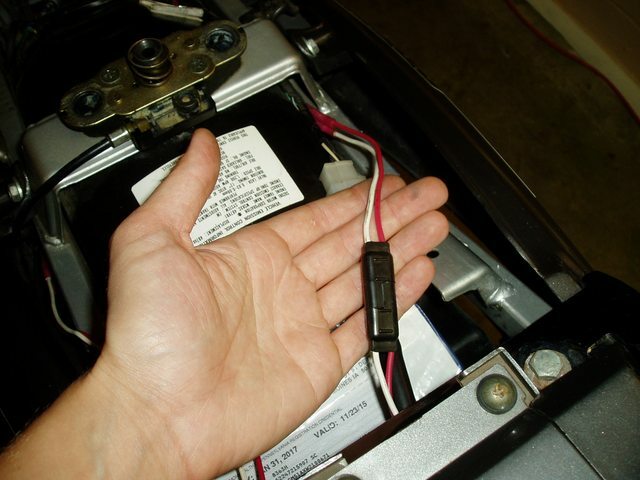 and reattached the lilcense plate, it ends up being right up 1 mm against the taillight. I spent no monies to do this modification and reused all the oem parts. with the body kit mounting screws, I measure the hole so the reflector plate once mounted straddled the oem moounting point. hardware I mount it in place. pictures now seems to have dissapeared..